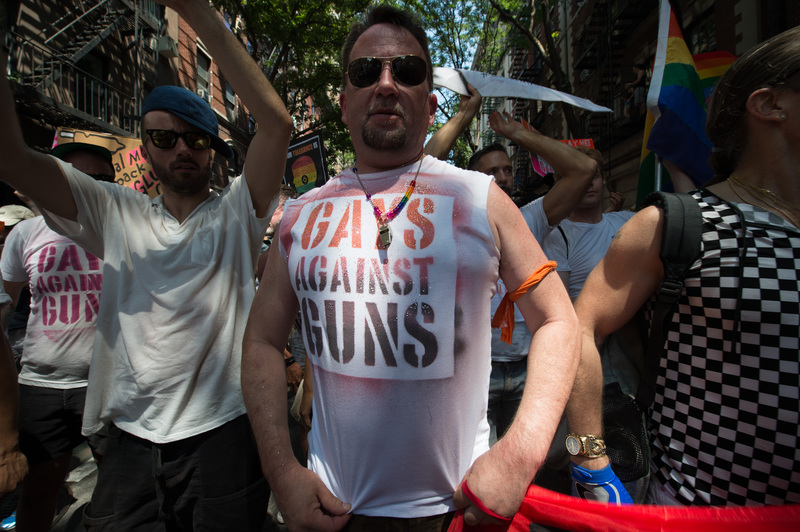 Gays Against Guns, or GAG, was formed a week before the pride parade, not long after 49 LGBT Americans were killed in the deadliest mass shooting in US history. The group is still “figuring out our place in the larger pre-existing gun control movement,” according to a post its Facebook page, but its website lists a couple of specific policy demands: A ban on assault rifles and high-capacity magazines, more thorough background checks for gun purchases, and elimination of the gun show and Internet sales loopholes. The group saw an enormous turnout when it unveiled itself during Pride weekend, and drew praise from NYC Councilman Corey Johnson. GAG didn’t return Bustle’s request for comment. But it’s notable that, for the time being, the group appears to be focused on changing gun laws, not policies that tackle LGBT equality. That makes sense: While the LGBT rights movement has enjoyed enormous progress over the last five years, both in terms of policy and public sentiment, advocates of stricter gun laws haven’t been nearly as lucky or successful. Last week, Senate Republicans blocked an attempt by Democrats to bar suspected terrorists from purchasing guns, but this was only the most development in a long, long trend of legislative inaction on firearms. LGBT Americans are more likely to be the target of hate crimes than any other minority in the country. It was probably only a matter of time until a group like GAG came into existence, and the NYC Pride march was the perfect place to make its public debut.